This trainer provides students and instructors with the opportunity to demonstrate, investigate, and fault-find a simulation of typical diesel electrical systems. 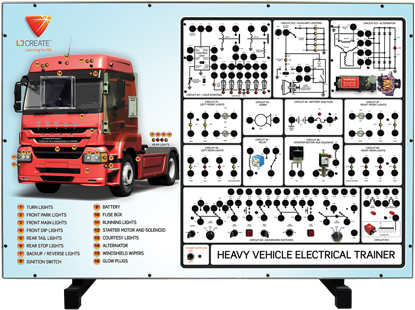 The trainer is designed to allow access to a variety of test points for vehicle electrical components, as well as provide an understanding of the overall system layout and configuration. To facilitate the development of techniques in diagnostics and fault-finding skills, the panel includes a range of fault-insertion options to simulate typical real-world system malfunctions.